An upsurge in new wind, solar and hydro plants and capacity saw renewable energy smash global records last year, according to a report on new supply. Some 147 Gigawatts of renewable electricity came online in 2015 – the largest annual increase ever and as much as Africa’s entire power generating capacity. Clean energy investment increased to $286bn (£198bn), with solar energy accounting for 56% of the total and wind power for 38%. Overall, more than twice as much money was spent on renewables than on coal and gas-fired power generation ($130bn in 2015), the REN21 global status report found. Leaked trade industry figures show a five-fold increase in the use of palm oil for biodiesel in Europe between 2010 and 2014, providing new evidence of links between deforestation in southeast Asia and the EU’s renewable energy mandate. The leaked figures, which the Guardian has seen, show that 45% of palm oil used in Europe in 2014 went to biodiesel, up from 8% in 2010. Greenhouse gas emissions from biodiesel are more than three times higher than those from conventional diesel engines when indirect effects are considered, according to recent research by the European commission. Simon Hackett, the executive chairman of Australian battery storage maker Redflow, says it is now clear that 2016 will be an inflexion point for the battery storage market in Australia, given huge interest from consumers and the rush of new products to the market. Redflow is preparing to release its 10kWh zinc bromine “flow” battery, known as the ZCell, into the market in August, where it will be competing with a host of new lithium-ion batteries, some of which – such as Enphase – are already reporting significantly higher than anticipated sales. 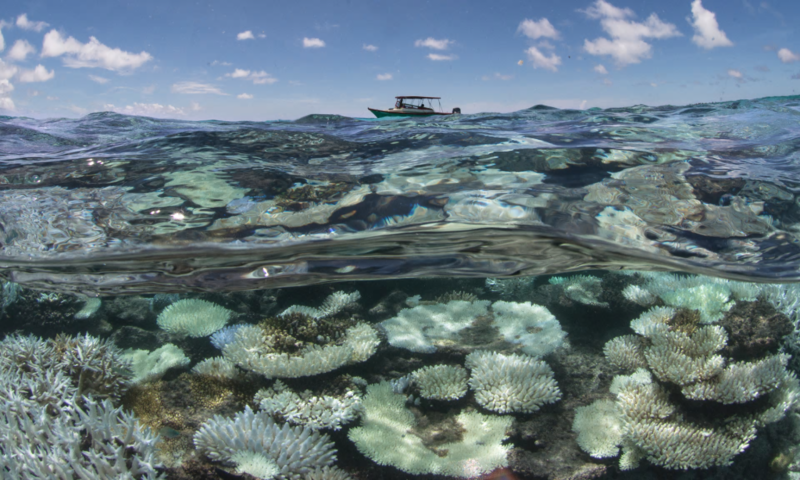 The longest global coral bleaching event in history is now devastating reefs in the crystal clear waters of the Maldives, with images released exclusively to the Guardian powerfully illustrating the extent of the damage there. Photographed by the XL Catlin Seaview Survey, the images captured the event in May as it moved beyond the now devastated Great Barrier Reef and into waters further west. Coral bleaching in the Maldives, captured by the XL Catlin Seaview Survey. Richard Vevers of the Ocean Agency says the damage is ‘truly haunting’. Most ecologically harmful is China’s construction of artificial islands, which biologists say could lead to permanent ecocide. From his living room in the Chinese fishing port of Tanmen, Pu Xidong offers up a giant-clam shell for $1,200 — a great deal, he says, for a bivalve that can live up to 100 years. Or how about a bloom of endangered red coral for a little less cash? The fisherman from China’s southernmost island province of Hainan extracted both from the distant — and contested — reaches of the South China Sea. Armed with thousands of dollars in government subsidies and a free satellite-navigation system that would cost tens of thousands of dollars on the open market, Pu regularly ventures out to the Spratly Islands, a sprinkling of isles and reefs that are claimed by various regional governments. Life is found almost everywhere on Earth, but each species is limited in the range of places and environments within which it can live. Understanding the distribution limits of a species is an old and fundamental problem in ecology. It is also an important practical problem. We need computational tools to predict how the potential distributions of pest species, disease vectors and threatened species may change with the climate if we are to manage them properly. Nature reserves will be established in Canberra’s north and south to protect endangered species and offset the creation of new suburbs. The ACT Government has allocated more than $5 million in its 2016-17 budget for the sites in Gungahlin and the Jerrabomberra Valley. NEW ZEALAND – A population of native ducks on Auckland’s Motutapu Island has been given a boost with the release of a raft of pateke. A flock of 40 of the native brown teal were set free last Wednesday in Motutapu’s biggest native bird release. Pateke are one of New Zealand’s rarest native waterfowl, but the population is recovering thanks to intensive conservation work. Two-thirds of U.S. employees feel their work and personal life are becoming increasingly blended and nearly all (93 percent) want to work for a company that cares about them as an individual, according to the 2016 Cone Communications Employee Engagement Study. The study reveals an increased expectation for companies to provide not only basic benefits but also ones that allow employees to bring their passions for social and environmental issues to the workplace. A 36kW solar system installed at an indigenous community in Western Australia via an “impact investment loan” is expected to displace 20 per cent of the 100-person community’s electricity use… The “impact investment” project is believed to be a first for Australia, in which capital is used to generate social or environmental outcomes as well financial returns. Sydneysiders looking for a more fancy ride from A to B than Uber, or for a greener ride, or to experience driving in a Tesla Model S, can now satisfy all of the above urges using Evoke – Australia’s first zero-emissions luxury chauffeur service. Founded one year ago this month, Evoke’s Sydney-based fleet of pure electric vehicles has expanded from one to four Tesla Model S limousines, which have together clocked up a cumulative mileage of more than 200,000km. East of Lake Tahoe, an organic farmer and his son are putting the finishing touches on what is perhaps a counterintuitive approach to water conservation in a dry climate: a 32,000-sq ft greenhouse that will grow tomatoes, peppers and fish in the heart of the Nevada desert. New Zealand is joining the global fight against food waste, with the launch today of a three-year Love Food Hate Waste campaign, a joint collaboration between the Ministry for the Environment and 59 councils from around the country. Last month, I traveled to D.C. to speak at the Innovation Forum on Deforestation in Washington. This event provides a unique forum for large corporations and conservation organizations to engage in dialogue about opportunities and challenges related to improving forest conservation outcomes around the world. The conversation kept returning to what seemed to be universally and unquestionably accepted as a central challenge in achieving large-scale improvements in conservation outcomes: influencing the forest management practices of private landowners. This conversation seemed, in some ways, mind-boggling given that existing markets, when combined with favorable government policies, have been influencing landowner forest practices on a very large scale for decades. A week-long meeting of 2500 delegates from 174 countries has wrapped up after adopting 25 resolutions on subjects ranging from green finance to the trade in endangered species. But the resolutions adopted at the headquarters of the UN Environmental Programme in Nairobi, Kenya, call for little in the way of new action, or fresh finances to tackle the world’s environmental messes. AUSTRALIA – Federal Labor has restated its policy commitment to bolster the development of community renewable energy projects in Australia, a plan it says will allow more regional and suburban communities to regain control of their power costs and supply. Labor’s plan to create a network of Community Power Hubs to boost jobs and facilitate the installation of small-scale renewables projects was announced as part of its broader climate and clean energy policy in April. I’m not qualified to decide whether fat is good for you or will help you lose weight. But as a philosopher, and someone who has studied diet and health-related behaviours, I am curious about the question. What we ask determines what sorts of answer make sense. Does it make sense to focus on nutrients such as fat or carbohydrates, for example, or should we reframe the question? Buildings currently being constructed at an increasing rate in developing countries are locking the world into high greenhouse gas emissions for decades to come, the world’s leading authority on energy has warned. Fatih Birol, executive director of the International Energy Agency, told the Guardian that the world’s number one priority in tackling climate change must be to ensure those buildings meet higher standards of efficiency and safety. The Rockefeller Foundation’s 100 Resilient Cities initiative reached its target last week of securing 100 member cities within three years of being created. The global 100RC initiative is designed to enhance urban resilience and it welcomed 37 new member cities to its network last week… The 100RC project is pioneered by The Rockefeller Foundation to develop the capability of citizens, communities, institutions, and businesses within a city to survive, adapt and grow in the face of environmental, social, and economic challenges. Swedish carmaker Volvo has developed a new concept truck which can make 30% savings in fuel consumption, with the vehicle forming part of a five-year long research project aiming to improve the efficiency of long-haul transportation by 50%. NEW ZEALAND – The rain that falls onto Brookwood Station ends up in the Tukituki River, which means the owners have to adapt to meet the Hawke’s Bay Regional Council’s Tukituki Plan Change 6. A farm environment management plan has just been done for the 1125-hectare property as part of a trial by the council. Owner Justin King says the station has a huge number of small tributaries that flow into the main waterways leading to the Porangahau Stream. Water then flows into the Maharakeke Stream, then into the Tukituki River.